Toyota has shown the world its new Avensis saloon and estate models at the Geneva Motor Show. The Avensis gets a neater head and tail lights with LED bulbs, plus the latest safety gizmos and updated, cleaner engines. The cabin has been revised to bring it up-to-date with the latest from manufacturers like Ford and Mazda, with satin metal finishers in the steering wheel and dashboard, plus more upmarket materials and more comfortable seats. Trim levels have been enhanced, bringing buyers a greater level of standard equipment. All cars get 'Safety Sense', which includes lane departure warning, auto-dipping headlights, traffic sign recognition and a pre-collision system. The engine range consists of 1.6-litre and 2.0-litre diesels with 110PS and 141PS respectively. There are also petrol options ranging from 1.6-litres to 2.0-litres, with power outputs of between 130PS and 150PS. Emissions are down across the board compared with the outgoing car - the most frugal diesel manages official economy of 68.9mpg and emissiosn of 108g/km. The company says that the car will appeal "to fleet and private customers alike," which suggests Toyota is confident that this version of the Avensis will be more than daily rental and large scale fleet fodder. The Avensis will continue to be built in the UK at Toyota’s Burnaston facility, close to Derby. Toyota had a good year in the UK in 2014, selling over 94,000 cars and enjoying a six per cent improvement on the year previous. 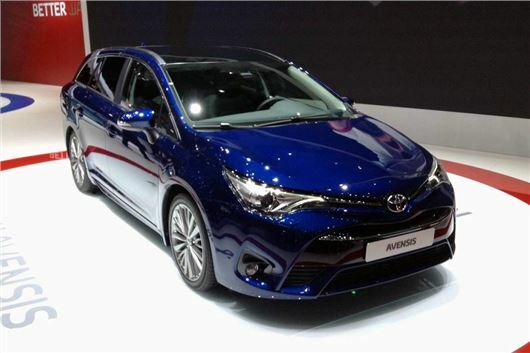 It hopes that both this new Avensis and the recent Aygo will see it achieve an even more successful 2015. When will this updated Avensis be on sale in the UK?